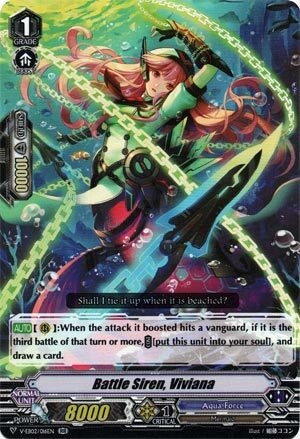 [AUTO](RC):When the attack that it boosted hits a vanguard, if it is the third battle of this turn or more, COST [put this unit into your soul], draw a card, and one of your units gets [Power]+3000 until end of turn. This is actually misprinted: it also gives a unit +3000 power until end of turn when you use her skill. So, what sort of compelling reason is there to run her? You know, aside from the obvious answer of ‘there’s bugger all else’. Well, she threatens on-hit pressure: that extra 3k can lend itself to a restander that needs the numbers to let Maelstrom actually threaten or kiss magic numbers if you’re on Navalgazer or something. But really it’s the fact she fuels soul and is a +0 wash that fuels guarding…if she hits. Not one for Jeffery clones but at least if she goes off that’s one less card that Kagero can crap on.